The James Beard Foundation Awards were established in 1990 and are often called "The Oscars of Food.” Held on the first weekend in May, the Awards honor the finest chefs, restaurants, wine professionals, journalists, cookbook authors, restaurant designers, and other food professionals in the United States. The awards are voted on by more than 600 culinary professionals. 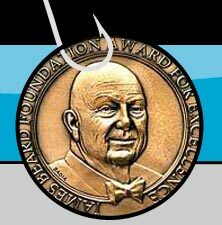 Recipients receive a bronze medallion etched with the image of the late James Beard and a certificate from the Foundation. Calumet Fisheries was named one of the five honorees for the 2010 James Beard Foundation Awards America’s Classics category. 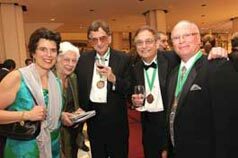 This year’s five America’s Classics honorees were celebrated at the annual James Beard Foundation Awards, the nation’s most prestigious recognition program honoring professionals in the food and beverage industries. The America’s Classics award is given to restaurants with timeless appeal, beloved for quality food that reflects the character of their community – from small, regional restaurants, watering holes and shacks, to lunch counters and down-home eateries that have carved out a special place on the American culinary landscape. 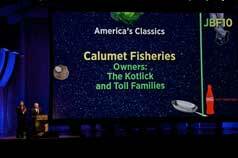 Click the image to view this great video of Calumet Fisheries, compliments of the James Beard Foundation. More great articles and videos! James Beard film crew visited Calumet Fisheries on Saturday, March 14, to get footage for the May 3 awards ceremony. The Windy Citizen:Calumet Fisheries: James Beard Award Winner and Pride of the South Side!